Francis Livingston, Beaver Creek Waters, Oil on Panel, 11" x 14"
Francis Livingston keeps his canvases fresh by working on imagery other than Southwest. “This actually works to inspire me because I am always anxious and excited to return to Western paintings,” says the Idaho artist. 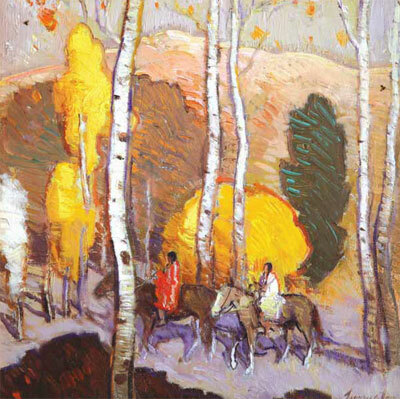 Livingston describes his new work as somewhat impressionist, with shapes and images created from smaller brushstrokes. While always trying to create color balance and harmony in his paintings, lately he has been experimenting with new color variations and trying different and more combinations of oil paint than before. Ideal examples of this latest direction resonate in Beaver Creek Waters and Amber Nearby. “They appeal to me because I was using slightly different color palette,” says Livingston. “In Amber Nearby, the brushwork has smaller strokes within a contained or outlined shape, such as a tree or mountain. Beaver Creek Waters has the light source coming from the back, not from left or right, which is something I’m experimenting with more.” The majority of Livingston’s new work contains New Mexico Native American Pueblo imagery with particular focus on Taos, Laguna, and Acoma pueblos. 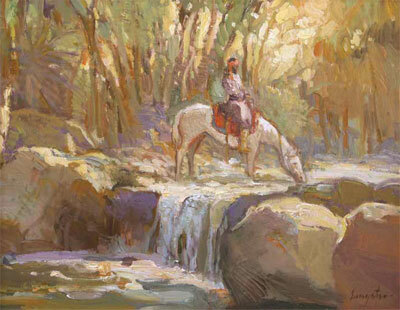 There also will be cowboy and fly-fishing scenes, with pieces ranging in size from 12 by 12 inches to 30 by 30 inches. 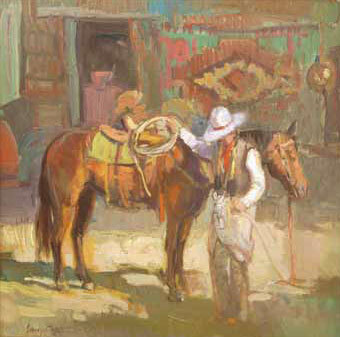 Medicine Man Gallery in Santa Fe, New Mexico, will exhibit up to 20 of Livingston’s new paintings throughout June. 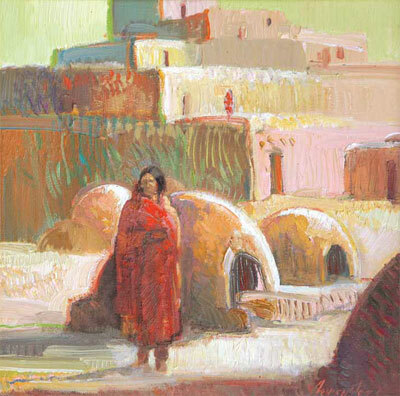 Francis Livingston, High Desert Light, Oil on Board, 12" x 12"
Consistent with his past works, these pieces have a historical context to them. Francis Livingston, Amber Nearby, oil on panel, 12" x 12"
"Francis Livingston's paintings are invariably compared to works by the Taos Founders. His work captures the same essence of those great masters; people are invarably surprised when I tell them he's very much alive and still has a great head of hair." - Dr. Mark Sublette, owner, Medicine Man Gallery, Santa Fe. Francis Livingston, Late Day Shadows, oil on panel, 16" x 16"
Influenced by such artists as Ernest Blumenschein, who worked on paintings until he felt the images and quality were right regardless of how long it took, Livingston constantly works and reworks a piece until he achieves perfection. The result is often an image that boasts a spontaneous feel, disguising the amount of time and energy it took to create. 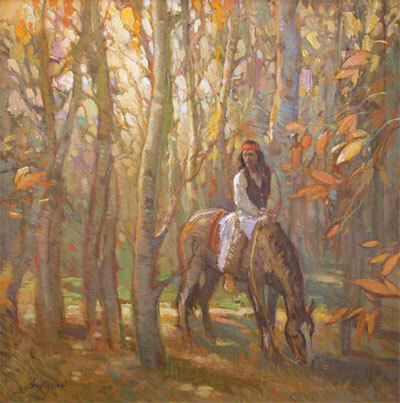 Francis Livingston, Quiet Forest Light, oil on panel, 20" x 20"